Amanda Murphy Design: Sew, Mama, Sew Giveaway! It is time for the "Sew, Mama, Sew!" giveaway day! I will be giving away one fat quarter bundle of Swiss Chocolate in either Mocha (blues and tan) or Chocolate (reds and brown) - your choice. 10 fat quarters are included! Kimberly at Fat Quarter Shop still has bundles and some yardage available as well. The deadline to enter is May 25th and I'll pick the winner randomly on May 26th. Become a follower and leave a comment to enter, or, if you are already a follower, just leave a comment on this post. Tell me what you would make with your bundle! I apologize ahead of time that I have had to turn comment moderation on due to some nasty person out there spamming this post. Keep entering - and I will approve comments as soon as possible! Happy sewing and good luck! Hmm, I think I would make a quilt for my brother's family. I can't decide which bundle would work better for that though. Thanks for the giveaway and I love your new line too. I think I'd make a quilt for my mom. She's pretty great! Hi! I would do some quilt for the new house we're in the proccess of buying, our first!! Love the Mocha Color Story. I'd make a quilt for a loved one. I love the rich colors in this fabric line! I would make a nice snuggly bed quilt for this fall! Love the chocolate colorway! I see a quilt being made if I would actually win! I'm a follower! hmmmm - decisions, decisions! I'll choose Mocha. I'd make a quilt with these yummy fabrics! Thanks for the giveaway! I already follow you & I would have to make a quilt with the bundle. Thanks for the giveaway. I'm following! Another set of pretty fabrics. Perhaps Id make a quilt, for me this time :) Thanks! I'm already a follower - and if I won either of these I think I'd have to start looking at some nice bag patterns to sew. These would make a delicious collection of totes, purses, make-up bags, notepad cover, and so on, even though I've never tackled any of those projects yet! Gorgeous fabrics! I've wanted to make a large purse/tote with some of the mocha colorway ever since I first saw these fabrics. That would be my first project (of many!) Thanks for the chance! I'm already a follower :) I think I'd make a cute apron with this lovely fabric- I love the chocolate colorway! I am already a follower and I love the mocha colourway, I would make a quilt for a wall hanging for my lounge. I am already a follower and I love both colourways so it is very hard to choose which one I would choose. I want to make my uncle a quilt so I would pick the blue since that is his favourite colour. Thanks for the opportunity to win. Love your blog! I can't choose which colourway I love best... they are both gorgeous! Thanks for the chance!! I love the chocolate color the red is beautiful. I would make a tote bag. Thank you for the chance to win these beautiful fabrics. I love the chocolates! I would make a small quilt for my son. I am already a follower, I like the Chocolate Color Story. I'd make quilts for my twin granddaughters. They just turned one and I haven't made them quilts yet. The mocha color story is beautiful! Thanks for the giveaway! I'm a new follower! I love the Mocha colorway... I'd make a quilt for my sister-in-law's wedding gift, I think she'd love the blues and browns! The red and chocolate look SO good together! I am imagining what pattern I can use them for! I'm already a follower here, as well as on my Reader. I've love both of these colorways ever since I saw them. I think I might make a tablerunner. I am a new follower. I love those fabrics. Probably make a lap quilt or a table topper. Both colorways are lovely but I think the blue-tan would work better for me. Thanks for the giveaway. Yumm the mocha looks so great! I think these colors would make a great table topper and placemat set for my new house! Gosh, I love your fabrics. :) I'd make a quilt. I'm a follower already. I love the Swiss Chocolate line. I'm about to start a blue and brown quilt for my sister's bed so I would probably have to pick that bundle and use it in her quilt. Thanks for the chance to win! I am a follower. These fabrics are beautiful. I really like the mocha colorway. Blue and brown is one of my favorite color combos. I love the mocha color story! Just became a follower and going to your webpage as soon as done here! I am a follower and would love to use these fabrics to make a quilt for the sofa. Thanks. What a great giveaway! If I won one of these bundles I would make a quilt for my grandma. The blues and browns would match her room perfectly. 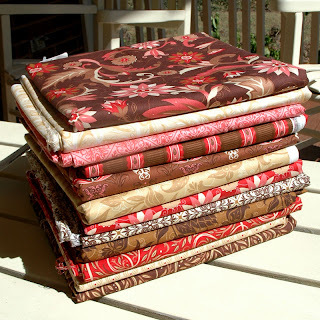 I would definitely be making a quilt - the red/brown is perfect for a quilt for my Mom! I love the chocolate color way... the reds and browns would go perfect in our living room. Of course, they would make great market totes as well... hmmm.... decisions, decisions. Giveaways are such fun. Thanks for participating. I love the mocha colorway. Already a follower!! 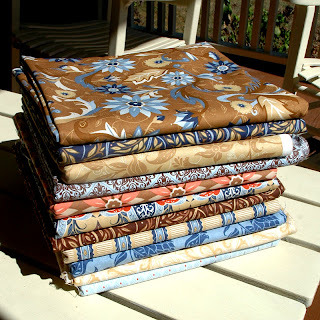 I love these bundles - I'd make a quilt for my sewing space. I think it'd make me inspired to keep creating! I would use the Chocolate Color Story to make a quilt for my little sister. Thank you for the giveaway. i'd love a chance to win the Mocha fabric! i would use it to make the sweetest baby quilt!! Love love love chocolate... the real stuff and the fabric! ;) Thanks for the giveaway! I love that chocolate fabric! I hope I win!! I am a new follower and LOVE the Mocha collection very much! Thanks! Both fabric lines are gorgeous -- but the chocolate is my favorite! Your fabrics are absolutely wonderful! I've been following your blog for a while now. Lots of goodies! I realized this weekend that we need some new pillows in our living room, so I think I'd use the fabric for pillows. Thanks! Oh I love both bundles. It's hard to chose a favorite. But I would love to win the Mocha bundle. I'm already a follower. Either bundle would be great and I would make your Chocolate Torte pattern - love it! *wave* New follower here!! I love both fabric collections - what juicy colors!! would have to go with the mocha bundle. a friend of mine is moving away, I would make this for her. I'm already a follower, thanx for the chance! I'm a follower. I'd love to win the chocolate bundle. Thanks so much for the opportunity to win this! I follow in my Google Reader! Thanks for the giveaway. I like the Mocha colorway - beautiful fabric! Just became a follower! Love the Mocha color story and would probably put it to work making a bag or two. Thanks for the giveaway! I'd make a beautiful table runner out of the mocha or chocolate! Amanda - YOU DESIGNED THESE?!!! Woah - amazing!!!! I'll be honest, I don't know what I'd make with these. Probably bags, doll/little girl dress sets, and/or stuffed creations - that's what I am doing at the moment. And as for which one, I LOVE LOVE LOVE both of them. Seriously, I usually go with red, but that blue is so rich! mmm yummy love both but chocolate is gorgeous and I think I would make something for my best buddy. Thank you for the generous giveaway. I'f love the Mocha bundle, and I'd make a quilt for my mom. I'm a new follower and these colors are GORGEOUS! Mocha is sooooo pretty. I'm also a new follower! I would love to make a quilt for my parents. I would make a tablecloth set from the Mocha. Thanks for the great giveaway! I would love the red pack!! Although they are both very pretty!! I love the chocolate colorway. I would make a bag or a table runner. follow you on google reader. Thanks! Oh! I like chocolate so much! Thanks for this opportunity! I love the Swiss Chocolate with the red! I can't decide which I like better! They are both fab! Luv!!! !both colors. I think I would choose the mocha and make a purse and accessories to go with. Hope I'm lucky!!!! I like both! If I win, I want you to choose for me!! I kove them both. Either one would be fabulous! I would love to use mocha for a quilt for my oldest son! This would just be so perfect! Thanks for the chance. As I am swiss I just love chocolate,lol! Outstanding colors! I just started making fabric bowls and these fabrics would make fabulous pieces! I love the chocolate with pink. I have a thing for that colour combination. After looking through your blog and falling in love, I am now following you on reader. I would make a table runner/placemats/coasters. Thanks. I'm a follower. Thanks for a chance to win! Oh that is beautiful fabric!! I love the blue and chocolate. Two of my favourite things! I would make a quilt for me :) Does following on a reader count? I'll do it both ways just in case. These colors are just beautiful. I'm sure I would use them in my latest design, Primrose Promise. They are just perfect for it. Pick me! Pick me! Thanks & have a super day! Oooh, the blues would go beautifully in the quilt I'm making for my sister! I have been dying to make a quilt with red and brown -- that chocolate bundle would be perfect! And I already follow your blog. Yummmy! I love the maroon and chocolate! I would make some pillows for my living room. Such delightful colors! Beautiful fabric. I love the red and brown one. Thanks for the chance. Just let you know I am a follower now. I'd make a lap blanket out of the blue fat quarters. Thanks for the great prize!! I would use the chocolate, and make a quilt for my mom. Those are her colors! I'd definitely be quilting for my SIL. Not sure which patter I'd go for. Maybe Oh Frasson's birdbath? Thanks for the chance. I'd prefer the reds and browns, but I think my SIL would like the blues, so either one. I would just give the whole package to my daughter for her birthday in July! She wants to make a quilt for their master bedroom and she adores the colors in the Mocha line. Thanks for your generous giveaway! I would love to use either combo to make some cute little zipper bags for my mom for Christmas. It will probably take me that long to get them done. :) And I would have lots of leftovers. I'd definitely make a quilt with either of these choices! Thanks for the giveaway. Such lovely fabric! I would prefer the chocolate line but they both are beautiful. i love the mocha! what i would make? i don't know, i like to let the fabric speak to me ; ) now following and liking! ya hoo! What a cute quilt that would make for the daybed in my sewing room! just following now and I love the chocolate! I'm not sure exactly what I would make but I would have so many possibilities! I love the bundle in 'Chocolate' and would probably make everything from aprons to purses and pillows. I would choose the mocha color story and make a quilt for my grandmother who has made quilts for me & my siblings and our children and countless others. What a joy to find your beautiful designs through the giveaway! Love the Chocolate, and looking forward to following your blog! I'm a follower. I think I like the Chocolate color way best, but they are both wonderful. I need a quilt to brighten my bedroom that has realy dark brown drapes to block the light. These fabrics would perk it right up! Been drooling over Swiss Chocolate in my quilting magazine and I'm so honored to have discovered the creator! Bee-you-ti-ful! i would love to make a quilt for my daughter, who has just moved away to study...a long distance hug! She would adore the red and chocolate fabrics. I just started following you and look forward to checking out your blog! I could really go for a mocha right now! I would practice Japanese folded pathcwork and make a bag. New follower here! I LOVE the chocolate colorway.... It would become a very nice table runner in my dining room. Thanks for the chance to win. Just found you via SMS. Thanks for the giveaway and I look forward to exploring more of your blog! New follower here! Love the mocha...Can see making some things for our house with it! wow. your fabrics are amazing. I LOVE this Swiss Chocolate fabric line. i think i like the reds best... nice and warm. I'm not sure what i would make. probably a new quilt or a bunch of pillows for my living room! :) I started following you too! Oh, I love the chocolate with the browns and reds. I'd either make a quilt or a skirt with these ! Thanks so much for the giveaway ! I would make a beautiful blanket for my momma! Love the browns and reds! I just made my sister a brown and red quilt and would love to try and recreate it with these for myself! BTW...I'm a follwer! I would make some baby blankets. i'm a new follower. thanks for this giveaway! oh my gosh that is such a tough choice. i choose (squeezes eyes shut and types) chocolate. yeah, that red & brown is doing something to me. Lovely fabric! I especially love the stack with the pink. I'd make a happy quilt with it! I'm a new follower, today is my first visit to you blog. I was checking out your tutorials! You have some really wonderful things here. I especially love the blossom placemats and the Ambrosia Bag. I was just saw your new patterns! Oh my goodness! My favorites are Blossoms and Garden Paths. Thank you for participating in Giveaway Day! I love this fabric. I first saw it when you joined the Blockapalooza QAL and have wanted it since. I love the chocolate colorway. Thank you for sharing. I love stumbling upon new blogs and now I follow you. The Mocha colorway would make something wonderful for my Mom... those are her favorite colors. Thanks for the chance! This is great fabric! I love both of the colorways! I would make a lap quilt out of this! So pretty! (and I'm going to join as a follower! I can't wait to check out your blog when I have a chance!). What a generous giveaway! This would make a lovely pieced back for my current quilt! Thanks for the lovely giveaway. I see one of your quilt designs in my future should I win... maybe something with your design from QM 100 Blocks. Mocha with blue and brown is gorgeous. I'm usually a big fan of all things red, but I'm loving the mocha colorway. I'm a new follower! Hi, I'm a new follower! The Swiss chocolate is the perfect color way for a quilt for my own bed( that I have put off over and over again forever, lol). Thanks for doing this! Hi Amanda ~ I'm already a follower, and love your fabric...have tried to win some so many times! Maybe this Giveaway Day will be my lucky day! I think I like the chocolate with cherry color wave. I love reds. I think I would make some sort of applique quilt. Not yet in my skill set but willing to experiment. Already a follower. I LOVE the Chocolate colorway and the designs too! This fabric line is completely my taste. I think I would make a table runner that would look great against our dark stained quarter-sawn amish oak table. I am having trouble signing up to be a follower, but I've bookmarked your blog and I definately plan to sign up to be a follower as soon as I can. I want to see your other designs, so I'll be back. I would make a quilt or pocketbooks. I've been saving up for a pink and brown log cabin for quite a while now, and these would fit perfectly! YUM! Chocolate looks as good as it tastes. a pink & brown quilt has been on my to do list for some time now...but with a house full of boys, the brown & blue would be put to good use also! Yum!! That Swiss Chocolate looks yummy!! Thanks for the chance to win! Oh....I love the Chocolate colorway. I would make my niece a fat quarter quilt from a pattern I just bought from The Fat Quarter Shop. I like the mocha. I'm thinking a lap quilt for one of my best friends. I would definitely make a quilt for my daughter...I know she would love this line...thanks for the giveaway.. The mocha one looks so good! SUCH PRETTY COLORS! I'm a new follower. I really love the mocha one and my daughter would love a quilt made in these colours. I'm following you now! I'd love to make my mom a quilt with these beauties! Mmmm, who couldn't use a little chocolate served on a quilted blanket platter?!?! I sure would!!! Such a great giveaway, thank you for the chance to win! I would love the mocha colorway, and I'd make some throw pillows for our sofa. Thanks! My three favorite things chocolate, mocha and fabric! I would make either some pillows for the couch or a nice little quilt for the living room. I love these fabrics! Thanks for the giveaway. I am a new follower! I love the mocha colorway, perfect for a quilt for me! I'm a brand new follower! Luv you & luv both color sets. What a wonderful giveaway! I really like the mocha colorway. I would make a quilt for my new great nephew. What a wonderful giveaway. I would love to be a part of it. Thank you. atchisonsteph at gmail dot com. I am a new follower. I'd love to make a throw for my living room out of the chocolate color story. The warmth is just perfect for a cold winter evening. Thank you for hosting such a great giveaway. Follower! Love your blog - and the mocha - I can just dream up all kinds of options! hmmm love the blues. can I just stroke it for a while? It would have to be a quilt. I didn't use to like browns but both those packages are delicious. I ould love the mocha. i need a new quilt for my room. I have loved this line for quite some time and am so excited about Veranda!! wow. i love them all. thank yoU! I'm a new follower. I'm also a new sewer with very little (aka 'no') stash, so I'd take either. I'm not sure, yet, what I'd do with it. I have lots of plans, but no fabric to sew with! New follower here! What great fabrics for a giveaway, both colorways are just beutiful! That fabric is beautiful! I would love to turn it into a quilt in either colourway! They're both so pretty! I would make some quilted purses for my Mom and grandma or maybe a quilt for my Mom. What a wonderful giveaway. The blues and browns are so luscious! they are both beautiful, I'd make a quilt for my own bed, its naked! I would choose the blue and brown. I would make table runner or placemats. I would make a throw for my living room. The chocolate colorway would go with my new furniture. Oh my I love them both but if I have to pick one I will go with the chocolate one. I think I would make tote bags/purses. I'd make a quilt for my bed. My husband always complains that I'm making quilts for everyone else - we don't get to keep any! MMmmmm, chocolate! I think it would have to be a quilt for my bed! I'm a new follower & would love the Chocolate colorway! Thank you for the giveaway! I love the chocolate color story! I'm a new follower. Wow! What a great giveaway! Thanks for participating in SMS Giveaway! I am a new follower and I love the chocolate color story. Thank you so much for the opportunity to win this. beautiful. I would make a quilt. I'm a new follower. i love the Mocha color story. I think I would make a quilt for my bed and pain the walls to match.